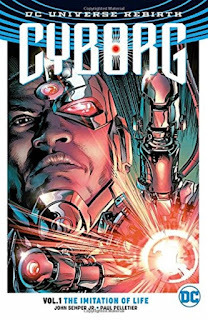 Cyborg (Rebirth) Volume 1: The Imitation Of Life by John Semper Jr. This was really good with a serious storyline. The book starts with a summary of Victor Stone, his parents and how he came to be Cyborg. This pretty much seemed to recap what I already knew of his background. The rest of the volume involves one story arc which has several branches, the main two being Cyborg's search for his humanity, his soul, and a new villain trying to take over the world. This is a robot collective who wants to wipe out humanity and have their freedom from mankind. We don't exactly know who the main bad guy is but there are some hints. A lot of great Cyborg vs giant robot battles and an ending which sees the coming of a new metahuman but is she a superhero or a villain. Really enjoyed the integrity of the story.